Our Jewish, Muslim, and Christian friends worked to translate these ever important texts in varying languages. Certainly the completion of the double, sometimes triple translation (Greek into Arabic, Arabic into Latin, and sometimes Spanish) is one of the most fruitful scholarly enterprises ever undertaken (1). Once the books were translated, they had to transcribed for dissemination. Listen to some chanting and get in the mood for some work! 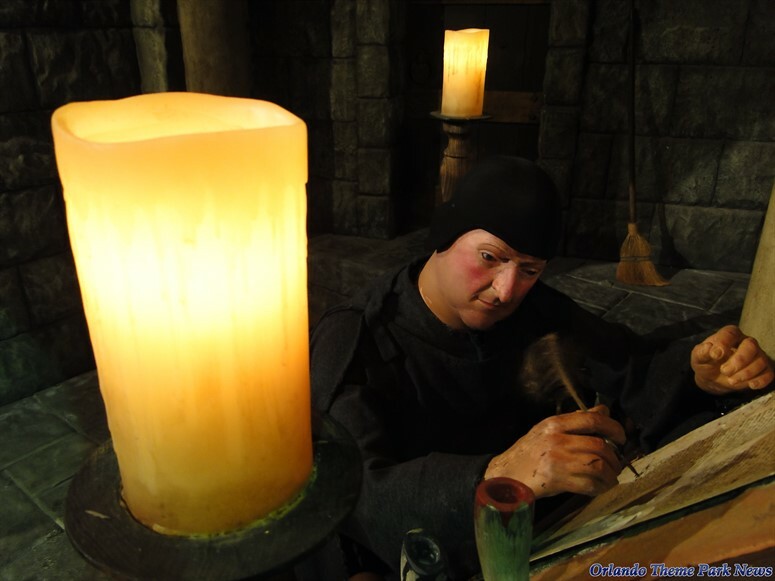 Enter the monks who lived in isolation in a western abbey such as the Monte Cassino. These monks, perhaps taking a vow of silence (hence the lonely isolation) would not only transcribe the words but also managed the formatting and illustration by hand (2). No Microsoft Word Template for these guys. There is fantastic detail in this short scene. 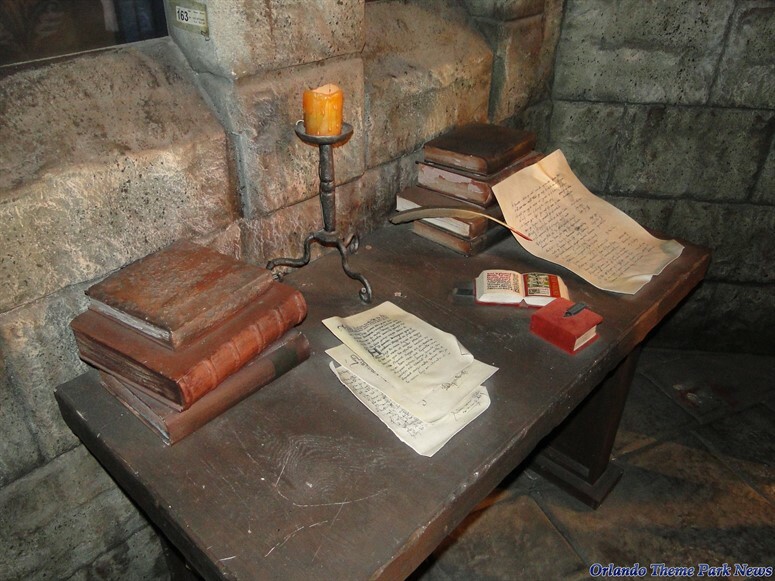 The manuscripts used in the scene are great representations to the real thing. 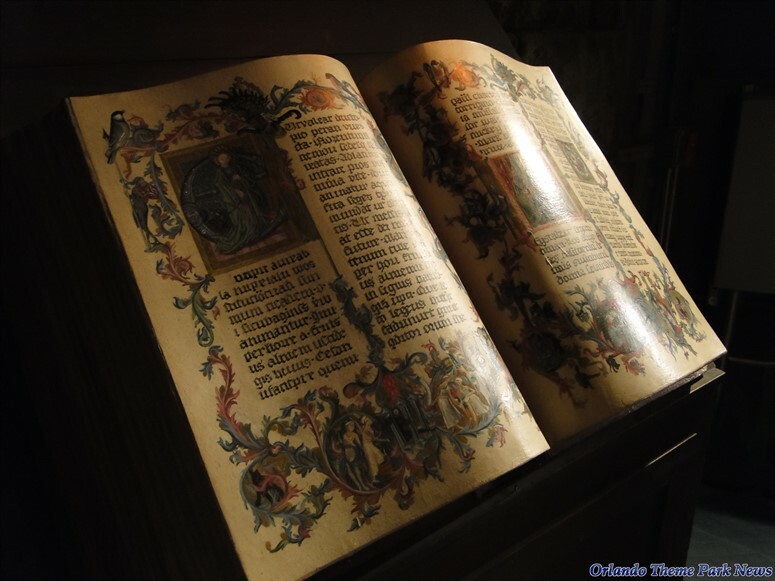 According to Jim Korkis, Mary Robertson, the curator of Rare Manuscripts of the Huntington Library in San Marino, Calif., was consulted regarding creation of manuscripts during the Middle Ages (3). Orlando Theme Park News captured some fantastic detail below. 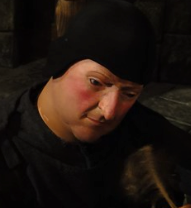 One of the favored scenes in this ride is the monk who has fallen asleep on the job. The dude is unabashedly snoring. This is cute and humorous but also true to the humor of some of these scribes. Now I’ve written the whole thing: for Christ’s sake give me a drink. At least some humor could be found by the monks toiling away! Because animatronics are complex, time intensive to create, and expensive – its common to duplicate the models that are made and dress them differently. In this scene – The monk that is awake and transcribing is said to also be the John Adams from the Hall of Presidents (3). 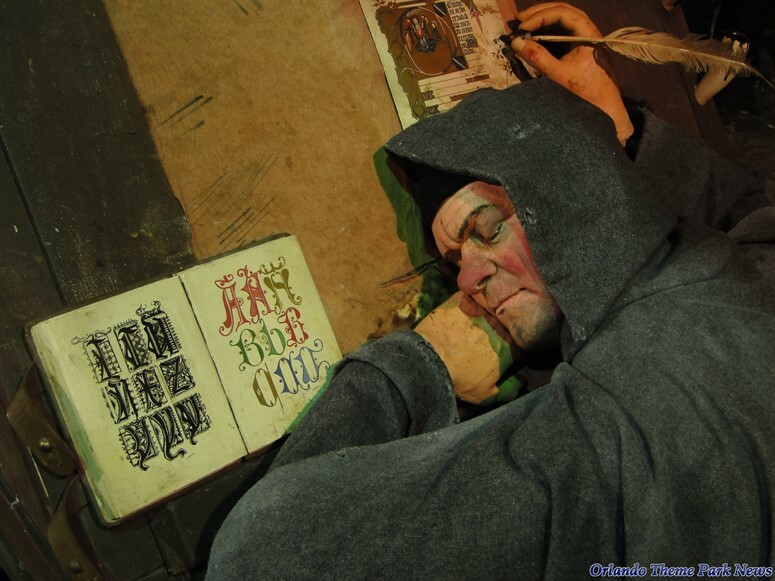 Rumor also has it that according to Jim Hill the sleeping monk in the monastary is the same figure as Woodrow Wilson in the Hall of Presidents but I haven’t been able to verify and I don’t see the resemblance. Wilson, like Adams is sitting, as are the monks so it would make sense for presentation purposes. In the meantime, here in Europe monks toil endlessly recording these books by hand, but that is about to change. In western abbeys, Monks toil endlessly in lonely isolation copying ancient books of wisdom and revelations for future generations. In western abbeys, Monks toil endlessly transcribing ancient writings into hand-penned books of revelation. In western abbeys, monks toil endlessly transcribing ancient wisdom into hand-penned books of revelation.